Rated PG for some suggestive and rude humor. Yes, this is an animated Christmas fable for children with a joke about Gwyneth Paltrow’s Goop-ish euphemism for divorce. There are also references to “Braveheart” and “Dirty Dancing,” sure to delight the kiddies. Most perplexingly, a key element of the plot concerns illegal doping to win an athletic competition. And when a character cheerfully says he won’t need to learn to climb a snowdrift because “global warming will make this a non-issue,” another replies, “I don’t think our strategy should be predicated on an ecological catastrophe from which the world will never recover.” That should lead to some awkward questions as families frost the Christmas cookies. 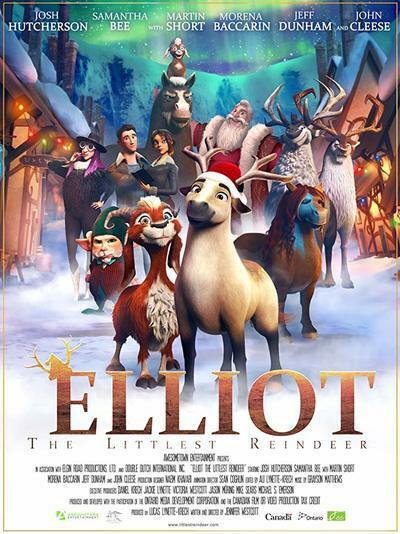 Despite the title, Elliot is actually not a reindeer, although he is little. He is a miniature horse (do NOT call him a pony) and he lives on a small reindeer farm and petting zoo run by a former baseball player named Walter (Rob Tinkler). A deep-voiced woman (Martin Short) has made him an offer to buy the animals. We know she must be evil because she speaks with a vaguely Slavic accent, travels with a pair of enormous henchmen, has purple ombre hair, and she literally drops a hint that her interest in the animals is less companionship than culinary. Elliot (Josh Hutcherson) helps guide the goat races that are one of the farm’s attractions. In his spare time, he trains for the kinds of feats that reindeer must be able to master if they want to pull Santa’s sleigh, guided by his best friend Hazel (Samantha Bee), a goat. Blitzen’s departure means Santa needs a new reindeer, and applicants, including Walter’s top candidate DJ (Christopher Jacot) go to the North Pole for a series of competitive events that are somewhere between the Olympics, NFL’s Scouting Combine, and Harry Potter’s Triwizard Tournament, except not nearly as interesting to watch as any of them. The reason this is so important is that last year there was a malfunction that led to a serious delay in present delivery, and a nosy reporter (Morena Baccarin) is asking a lot of questions. Santa wants to make sure that this year all the reindeer are up to the job. The elf he puts in charge (Martin Short) may have a different set of priorities. Elliot and Hazel stow away with Walter and DJ to get to the competition and Elliot enters with a fake set of reindeer antlers and a stolen credential from a reindeer disqualified for eating too many of Mrs. Claus’ performance-enhancing magic cookies. The action/competition scenes have some dynamism, but the overall look of the film is unimaginative. We are at that unfortunate stage in the development of animation technology when lower budget films like this one feature distractingly hyper-real details of fur and fabric but even more distracting shortcuts in the expressions and movements of the characters. They are more like shadow puppets on sticks than anything resembling the laws of physics. These are not exaggerations or simplifications as artistic choice; they’re just an inability to make the most of limited resources. The contrast between the too-real textures and the un-real movements creates a visual form of uncanny valley vertigo that is hard to watch. This is parallel to what amounts to an uncanny valley of tone. Though the movie is clearly intended for young children, many of the characters rely heavily on sarcasm and trash talk that will be difficult for them to parse (and no picnic for parents when children imitate it). The way the characters behave is entirely out of sync with the movie’s pep talk messages of “dream big” and “if it’s important you’ll find a way” and it distances us from any connection to them. John Cleese provides a brief bright spot as DJ’s demanding father, and Bee is a highlight throughout as the wisecracking Hazel. Hmmm, the best part of the animated “Ferdinand” was the calming goat played by Kate McKinnon—a spin-off with those two bovid characters would be a much better idea than this lusterless dud.